I was excited to learn that the newest Disney stamp sheets were being First Day Issued at the Expo. We did not end up hanging around long enough to even think about lining up for the ceremony, but I did end up buying them, which was more what I wanted anyways. The line was much shorter than the ones for the Disney shops, but it actually moved so slow it at least seemed as long as the one for the Disney Store. It turned out it was pretty much a full service USPS booth, so they were actually packaging and shipping stuff and not just selling the stamps. I bought a sheet of 20 to go with my collection that includes all the other Disney stamp sheets issued so far. 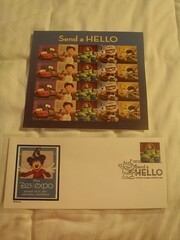 I also ended up getting the D23 Expo First Day Issue envelope featuring the Buzz Lightyear stamp. I debated about getting the stamped envelopes, but liked the D23 Expo ones better and it did not seem worth paying for the whole set. I kind of wanted the stamped postcards, but I only wanted to have one to mail for my postmarked postcard collection and it was not worth buying 19 extra just to do that. The line itself was accessible, but when we got to the front I ended up leaving Mik off to the side, as he would have blocked the path for others to get to the other counters if they opened up. Not to mention it would have been awkward to get him back out with the minimal space to go through the counter area and since he was not interested in the stamps it did not matter to him to not go to the counter.